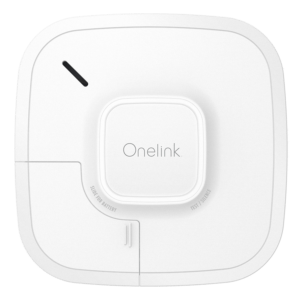 The First Alert Onelink GLOCO Wi-Fi Environment Monitor provides the status of any room in your home at a glance. Monitoring temperature, humidity, and carbon monoxide levels, the color-changing glow ring indicates a problem with four different colors, while the monitor sends information via the Apple HomeKit app to your smartphone or tablet. The carbon monoxide detector is easy to set up and ideal for a baby’s room, a vacation house, or monitoring your home while you are away. The LED ring on the monitor changes color based on the room’s environment. White means everything is just right, blue is too cold, and amber is too hot. A red indicator alerts you to the presence of carbon monoxide in the room. The monitor also sends push notifications to your devices with the app. The unit includes a back-up battery to provide power to the environment monitor in the event of a power outage. The system will continue to notify you of environmental changes outside your set parameters via the app even when the power is out.